We talk shop with the iconic Mumbai brand. Think handmade, and cement is often the last material to come to mind. Nobody told Bharat Floorings and Tiles. Established in 1922, this iconic Bombay brand might be synonymous with dressing up the city's institutions with its handmade heritage tiles, but they're more concerned with being the heritage of the future. Vice chairman Firdaus Variava, whose grandfather Pherozesha Sidhwa founded the company, has been turning this historical brand on its head since he has been at the helm. Collaboration, experimentation and innovation have become the pulse of Bharat Floorings–—their tiles have been hung up gallery walls thanks to contemporary artists like Thukral and Tagra, they've embedded LED lighting into cement tables, and designed collections with everyone from Sameer Kulavoor and Ayaz Basrai to Tania and Sandeep Khosla. Recently they turned cultural references like bindis, bandhini and kolam into clever tile motifs. We stopped by their recently revamped Fort showroom to test their new espresso machine and talk new interiors, new collections and the meaning of Future Heritage. Firdaus, congratulations on your recently revamped showroom. Ravi Vazirani (whose own home we featured back in our first issue) did the interiors. What was your brief to him? Ravi first revamped my home, and I was so pleased with the result I instantly offered him the store. He takes simple elements, and converts them into classic design. At our store, we wanted to portray both the history and legacy of the brand, as well as show what the future holds. He married the two stories seamlessly. The showroom previously had a classic look, with a more heritage feel to it. With this renovation, we turned the showroom into a studio space. The vibe is more modern and we are experimenting with various types of materials like new types of terrazzo, and metal inlaid tiles. The new showroom is more tech savvy, with better interfaces with the designers and display technology and for the first time, we may even have a Nespresso machine! Many people don’t know that your tiles are made to order. How does somebody place an order? Can you tell us about the handmade aspect of your tiles. We blend computer aided design with the craftsmanship and the end result is a floor that you can create yourself, which will last for generations. The best way to place an order is to visit one of our showrooms, and sit with our in house designers. They can work on the design of the tiles, and lay them into Autocad to give a feel of how the final floor will look. We encourage our customers to play with the colours and designs, and come up with something new. These tiles are made by hand using a century old process that involves filling coloured cement into metal moulds. This process revolutionised the tile industry at the turn of the 20th century, and we have been using it ever since. Once the design is finalised, it usually takes about a month for the tiles to be delivered to the site. Speaking of collaborations, tell me about the Made in India collection. What is the process of working on the Made in India collection? It has very strong referencing. Our design agency, Idea Spice came up with the idea. We were looking for ways to work together more closely, and Saurav Roy, their creative head came up with the idea of doing a workshop between BFT employees and Idea Spice employees. We have periodic workshops at the offices of Idea Spice and the various tiles were born out of an internal competition at the workshops. The workshops were great fun. We divide staff into teams, and assign each team a state to work on. The teams reference images of art and culture from that state, and then come up with designs that embody the spirit of that state. We initially started with the states of Madhya Pradesh, Rajasthan, Kashmir, Tamil Nadu, Gujarat and Maharasthra. In the second workshop, we chose states like Goa, Punjab, Himachal Pradesh, West Bengal, Assam, Nagaland, and Arunachal Pradesh. We chose art forms representative of those regions, and worked on designs. My favourite used to be the Rajasthan design, which is based on the jharokhas you find in a lot of buildings in the state, but now my new favorite is the endless knot design from Himachal Pradesh. At the end of each workshop, we have a lot of fun presenting and then choosing the best designs. Once the designs are frozen, the production team takes over in creating the moulds and informing us about the feasibility. A lot of very exciting designs get dropped at this stage, and we end up with a few that can be made. Its a long process, but the results have totally been worth it! There's also a new terrazzo tile collaboration. We collaborated with Studio SCD to produce a new range of tiles known as Hives (hexagonal tiles) and Macaroons (round tiles). Also in the works are some terrazzo with brass and stainless steel inlays. 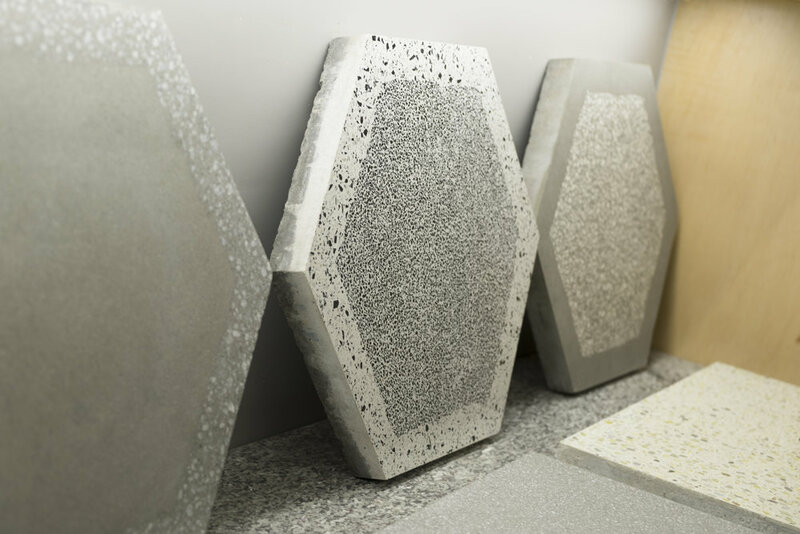 The beauty of the Macaroons are that you can lay them in different ways and then fill in the gaps with other materials such as stones, cast in situ terrazzo, or sand. The tiles can be used indoors and outdoors and can even become table tops. The Hives are hexagons which means I love them by default. Their larger size means they are great for big spaces, and they have two colours which means they can really bring a space alive. You do have a thing for hexagons. It’s your living room floor at home, it's your showroom floor and now you have a collection of hexagonal wall cladding. What do you love about it? I like hexagons because they are offbeat, and because the tile joints become another element in the design. In square tiles, the tile joints are kind of a hindrance. Most people don't want to see joints. But with hexagons, you can celebrate the joints and make them an integral feature of the floor. Collaborations has been at the heart of BFT for the last few years. What is your secret to a good collaboration? When the designer and the BFT team have worked before on some interior design projects, the collaborations usually turn out more seamlessly and without a lot of back and forth. This is because the designer understands our production process and the framework within which we work. Where this is absent, there is a fair amount of education required before the designer hits his or her stride in designing tiles. Every time I've come by, I've noticed new three dimensional concrete shapes. Tell us about some of these 'products'. We are always playing with making household items such as trays, candle holders and lamps. However, due to our collaborations on the tile front we haven't taken the products forward as yet. I am confident that by next year we will have some great products to show. These will complement our tiles, and can also be sold retail. What is this heritage of the future? Given that our tiles last a very long time (as of now, the oldest floor is 90 years old), it is inevitable that many of todays floors will be the heritage of the future. I want to be able to take my grandkids somewhere and show them one of my floors. We will get there using our hover-car or jet packs, but I'm sure the floors we lay today will survive for a long, long time! Bharat Floorings and Tiles is a Friend of LOVER. Visit their website and follow them on instagram.